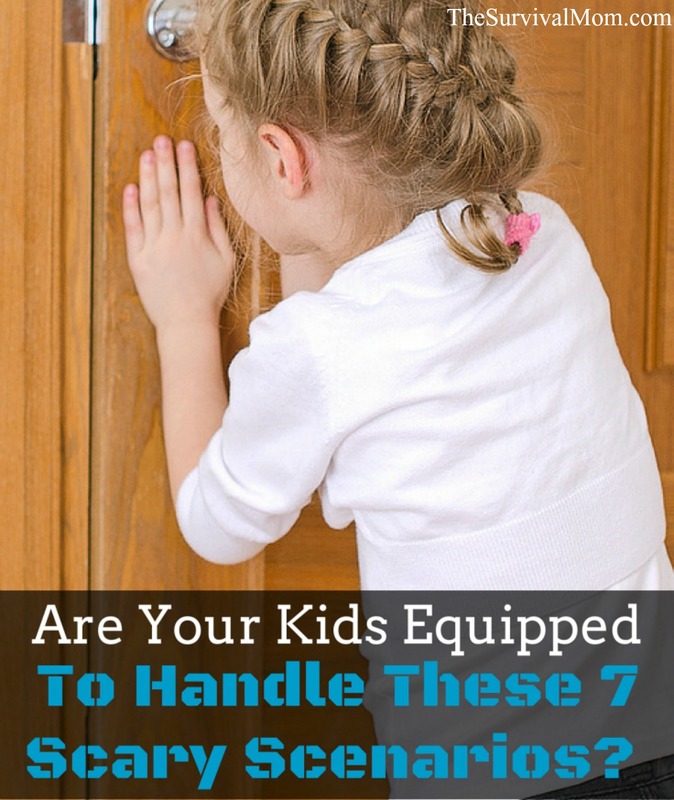 Are your kids equipped to handle these 7 scary scenarios? Our kids are already aware of many of the scary things that happen in the world around them. They hear about them from kids at school, on the evening news, and in conversations they overhear, so it’s not a matter of scaring them but equipping them. 1. A loud, sudden pounding on the door, especially at night. This would scare the heck out an adult, so you can be sure it would terrify a child. 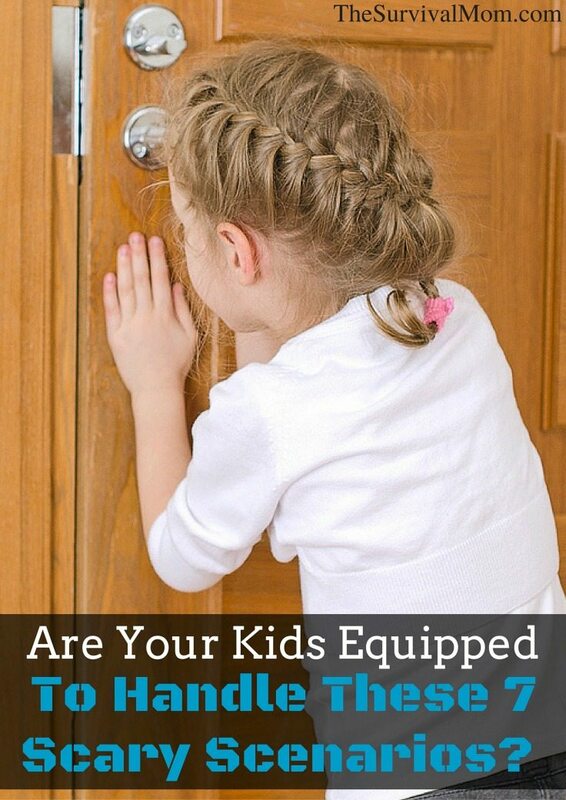 Your children should know to never answer the door in this type of scenario but to either stay in their room or go to a safe room/area and lock the door. For security, that room should ideally have a solid wood door with a reinforced lock like this one. 2. The sound of a breaking window. This could indicate someone trying to break in the house or simple vandalism. Either way, it’s scary. You may want to apply a security film to your windows to help prevent someone breaking into the house through a window. 3. A smoke or carbon monoxide alarm sounding. This article says that very often children sleep through a smoke alarm! Perhaps very young children should sleep in an area closer to their parent’s bedroom rather than on another floor or separate area of the house, making it easier for a parent to wake them and get them to safety. For sure, kids should know what these alarms sound like and what they should immediately do when the alarm goes off. This inexpensive alarm detects both smoke and carbon monoxide and even has a voice warning, which can be more effective to wake sleeping children. 4. A sudden scream from someone in the household. This could be due to a serious injury or someone having a heart attack. From my first book: “Here is an example of a routine based on a crisis in which children must handle a medical emergency on their own, without any adults present. Decide if a medical emergency requires a 911 call. If you answer yes to any of these, make that call! a. Is the person unable to get up or move? b. Are you not able to wake the person up? c. Is the person bleeding rapidly? Kid #1 calls 911 on a home phone. Kid #2 follows any instructions given by the 911 operator and calls Mom, Dad, or another adult family member. a. Secure all pets in a bedroom. b. Unlock the front door, so emergency responders can enter the house quickly. c. Make sure all lights are on in the house. d. The oldest child goes outside to signal emergency vehicles. Remain calm and answer questions from the emergency responders. 5. The driver of a car is suddenly unable to function. Does your child know how to steer a car? Does he or she know the brake pedal from the gas pedal? While driving, I’ve casually pointed out to my children how to put the car in reverse, where to find the brake and gas pedals, how to put the car in Park, and use the parking brake. 6. Loud, incessant barking from family or neighborhood watchdogs, especially at night. This alone can be scary and kids should know what to do. After all, the purpose of having a watchdog is that the dog will watch out for intruders! Sudden, loud barking might very well indicate that an unwelcome person is on the property. Kids should know to either come to their parent’s room or lock their own door while an adult investigates and wait for an “All clear!” or further instructions. 7. Sirens in the neighborhood. Whether it’s a police siren, ambulance, or a fire truck, sirens at a nearby house can be scary for kids. They should know to stay indoors and let a parent or other adult find out what’s going on. What other scary scenarios should kids know how to handle? Originally published May 29, 2013. Car alarm going off. This may be someone signaling that they need help. on how to determine if they need to call 911. We have the vocal/alarm combo alarms. There is beeping, then a voice says “fire, fire” My 2 and 5 year old both sleep through them every time. Ours go off multiple times each summer due to high humidity, so it’s not just a fluke that they slept throught it once-it’s EVERY time. I remember a while back there was studies about the fire alarms and kids sleeping through them. I think that they showed alarms that you could record a familiar adult talking calmly calling the children’s names and telling them what to do. They found the children woke and responded to the voice where they didn’t to the “noise” alarm. Worth looking itno. Would be awesome if your podcasts could be uploaded to the stitcher app. Then I could listen in the car! I signed up for a Stitcher account just yesterday, so as soon as we’re approved, you can listen to your heart’s content! # 5 is almost useless. Most children must be in a booster or child car seat until they are almost in their teens. Even then they would be in the back seat. By the time they got out of their seat and crawled over the seat to the front you more than likely would have already crashed and they would not have been buckled in so they would have worse injuries. Are you serious? My kids are 11 and 14 and haven’t been in booster seats in years. As soon as they were at the safe height and weight requirement for the front seat, they started sitting there. If your front seat has airbags they should not be in the front seat until they are 12. The airbags come out too fast and hard and could seriously hurt them. In my case, Sandy, I went by guidelines on a State of Arizona website using height and weight for front seat passengers. Other states and organizations may have different guidelines. I tend to agree here. I don’t think it would be good to teach a younger child to unbuckle and climb to the front to try to stop the car – but as soon as they are 12-13 and safe to sit in the front according to law and safety standards, definitely. I do think younger kids should be taught that it is okay to break car windows in an emergency, though, and how to use a seatbelt cutter. When we’re out in a public place, I’ll ask my kids, “If we got separated and you didn’t know where I was, what would you do? Who would you ask for help?” I make them point out specific people and explain why they made that choice – uniform, name tag, mom with kids, etc. When one wandered a few aisles away in a store, he said he didn’t feel scared because he knew exactly what to do. Everyone should know where and how to turn off the water to the house. Our pipes froze and burst one winter and the girls were terrified because they thought someone had broken in and had turned on their shower full blast, a la Home Alone. Children should also be very clear in where to go if the tornado sirens go off, especially if that safe place is not in their own home. Every home should have a list of phone numbers posted with neighbors, family, workplaces. Your own address should be on that list in case a babysitter is in charge when an emergency happens. We found out that caller i.d.is not accurate enough to guide emergency crews to our home in the country. I love the suggestion of locking pets up when crews are on the way.